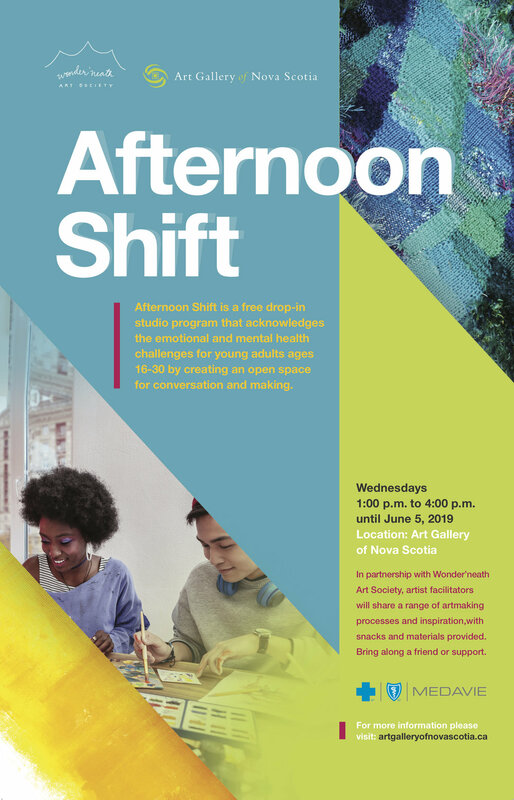 In partnership with the Art Gallery of Nova Scotia, Wonder’neath is pleased to announce a free, drop-in pilot program, Afternoon Shift, that is open to youth, their families, friends, and support networks. The atmosphere of the program is relaxed and supportive, with several artist facilitators on hand to guide you through specific techniques or help you get started on an independent project. Materials are aplenty with a range of drawing and watercolour painting supplies in one area, textile supplies including hand sewing, embroidery and needle felting in another area, and a third table with a changing focus from mixed media collage to printmaking to painting. Healthy snacks including veggies and cookies are supplied by Pavia Galleria. This program is fully physically accessible and multi-stall washrooms are all for all genders. Please contact Wonder’neath at 902-454-6860, or email us at wonderneath@gmail.com for more information. Generously funded by Medavie Foundation, an organization prioritizing child and youth mental health.